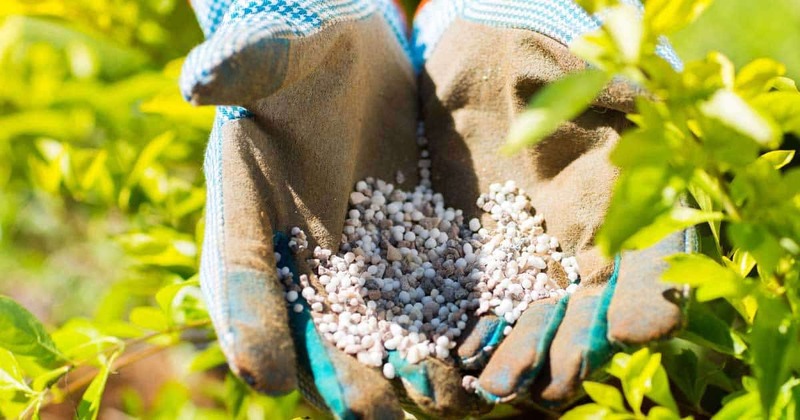 If you’re unsure of your specific garden fertilizer needs, generally you’ll not go wrong applying 10-10-10 fertilizer an “all purpose complete fertilizer”, balanced for plants. 10-10-10 fertilizer includes equal percentages of nitrogen (N), phosphorus (P), and potassium (K), the NPK of a particular mix of a fertilizer. This complete fertilizer is a popular and common form of fertilizer on the market. Knowing when to apply 10-10-10 fertilizer depends on the types and ages of plants you grow. For example, if you have well-established plants such as roses, strawberries, and asparagus an early slow release spring feeding will greatly benefit them. While green leafy plants and vegetables will benefit from a burst of nitrogen and the other nutrients when feeding a month after planting. Before placing anything including fertilizer in the garden, always read the instructions on the fertilizer label. In addition, always brush up on the requirements of your particular plant varieties and their fertilizer needs. If you’re unsure ask your local garden supplier any questions for requirements in your area. Once you know the fertilizer requirements and what to expect, get a soil test of the pH levels. This will indicate what your soil lacks and what additional needs such as organic matter the soil could use to improve plant growth. Some garden centers carry home soil test kits to use for this process. However, you can always bring a sample to your local agriculture agency or farm supply store for a testing. Before buying a pH testing kit from a store, watch this video full of helpful information by using vinegar and baking soda. Now that you know the needs, you’ll need to refine your math skills from high school. This area of fertilization makes many people uncomfortable. The application rates needed are calculated by measuring the square foot area and multiplying the pounds per unit. Of course, you can always estimate what you need, but doing so adds a mild risk of burning your plants. The video below explains how to calculate the number of bags or pounds of lawn fertilizer you’ll need for the yard, landscape and garden. Once all this calculation is done it’s time to head to the store and buy your 10 10 10 fertilizer. Depending on how much you need the best buy and value comes in purchasing larger 50 lbs bags which cost less per pound. Also, buying a slow-release fertilizer will feed plants continously throughout the season. Apply fertilizer by hand, dilution application, or broadcast application. Many homeowners find that applying the fertilize by hand or with an inexpensive broadcast applicator will typically deliver the easiest process. For individual plants, cultivate the area at the base of the plant. This allows the fertilizer easier access to the plant’s roots. Some gardeners add a granular 10-10-10 fertilizer product their compost pile to help break down organic matter and speed up the composting process. Many of the chemicals which make up fertilizers are highly corrosive and can damage your lawn equipment. Always clean all of your fertilizer spreader equipment thoroughly after applying fertilizer. Reduce the rate on younger plants as they are much more fragile and can easily burn through the use of fertilizer. To protect young plants, dilute fertilizer into a bucket of water and use the liquid water-soluble fertilizer solution to feed the plants. Not only does it protect the plants from over-fertilization, it allows for easier absorption. Calculate how much fertilizer you need and watch for approaching inclement weather patterns. Too much fertilizer and rain can lead to serious runoff situation. Not only does this waste money, but it can lead to hazardous environmental pollution. For more information on safely fertilizing with regard to local wildlife, talk to your local environmental agency. When using fertilizers always wear protective gloves, googles, and breathing masks. Once you complete the fertilizer application always make sure to wash all clothing and shower as soon as possible. Fertilizer does include some dangerous chemicals. In fact, it can be volatile and explosive under certain conditions. Always store with the utmost of care. Using the balanced n-p-k ratio of 10-10-10 fertilizer will help to beautify your lawn and garden. However, it is important to use it correctly for the best results and to stay safe. Hopefully, this information will allow you to use 10-10-10 fertilizer like a professional during the growing season.